In the past decades the workday of those in marketing and communications has changed immensely. At the beginning of the millennium many of them were still primarily professional buyers who commanded a large army of external partners. However, in the 2010s communications and marketing returned in-house one operation at a time. Simultaneously job descriptions became vastly more diverse and the standards became higher: the ideal employee produced great images as well as great text, organized events effortlessly, understood technology and social media, and wasn't afraid of search engines – not to mention the newest digital tools. Social media agency or no? In most companies social media has become a steady part of internal operations – which comes naturally since social media is one of the best channels to truly get up and close with the customer. On the other hand communicating on social media demands skills and working hours, and it's sometimes hard to keep up with the changing settings and the continuously evolving field. A professional social media agency might prove to be more valuable than gold especially in a fast-paced industry (when the target group is young people, for instance), or when a brand is very sensitive or operating in a volatile industry. + If you're working with a dependable social media agency, you know you're doing everything by laws and regulations, even if they change often. + You stay in the loop – the agency will make sure that you're visible on the social media channels that you should be on and that you conform to changes accordingly. + Possible crises are handled professionally and promptly. + Your social media is followed constantly – even when you're on holiday – and crises won't boil for long. + The publishing pace is usually optimal and work is organized – only a few companies operate internally as systematically and actively on social media as a good agency. + Social media reporting and analytics can be very challenging when done internally, whereas social media agencies have a routine of producing high-quality reporting. 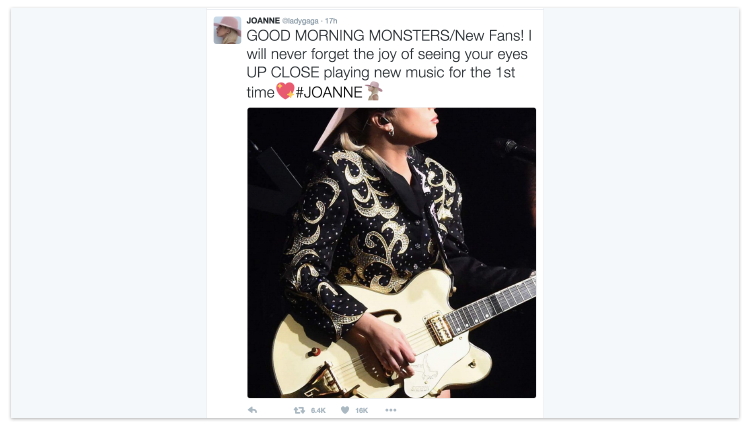 Image: Brands that rely heavily on a certain person, like Lady Gaga, are hard to outsource completely. Even though it's clear that the artist doesn't post everything herself, she also has real, private conversations with her "monsters" and also makes regular updates on her daily activities. - Social media is the best way to be close to the customer – you might lose a lot by giving control of it to an external party. - Direct conversations with customers and customer service are often harder through a middleman. - You might lose “your own voice” if you don't follow closely how the community and its way to communicate develops. - Your company's internal know-how of social media management might crumble. - Activating your personnel on social media or engaging them in content creation might be harder if there's a third party in the middle. Let an agency handle the continuous work, but stay close and actively communicate with customers on social media. Also keep yourself up to date through the agency, as well as in social media trainings. Buy high-quality training, create a professional content plan and calendar, and take care of the daily work and customer service on social media. However, use the agency for campaign ideas and execution. Using a PR agency is more than writing press releases and managing journalist relationships, and a trusted agency is vital for many companies. On the other hand, in media communications and journalist relationships, direct contacts with no middlemen are good to have. And when you need a press release published quickly, it might be best to do it in-house. + The agency has time even when you don't. + Writing a good press release requires skills that the agencies possess with a long experience. + A good PR agency can help you in the international markets as well with their networks. + Press releases can also be created in languages that are not mastered inside your company. + PR agencies usually have good relationships with journalists which helps press releases go through in the media. + PR work is often more organized and long-term when a yearly plan, for instance, is created together. - Relationships with journalists are valuable capital that should be acquired inside your company as well. - The skills for writing media releases can usually be found at most communications and marketing departments. It's also easiest to learn by trying what works for your own target group and what they are interested in. - It's easy to distribute press releases fast and target them at your industry's reporters with a press release distribution service like LianaPress, without a PR agency. Journalist contact infos are kept up to date in a press release distribution service. - Press release distribution services typically also offer the possibility for international distribution. Press releases are not created in a void in an agency either, and brainstorming and editing are done in cooperation with the customer. The best content and the juiciest details usually come from the personnel. Let an agency handle writing your press releases but participate actively in designing their content. Send media releases yourself through a press release distribution service and target the journalists and bloggers of your choice. Simultaneousy follow how your press releases are noted in the media with a media monitoring service and what kind of conversation they spark on social media. Content marketing is the core of marketing for more and more companies, and it's done with newsletters, in a blog, on social media, with videos, as well as by creating guides and presentations. The most important thing is genuine help and guidance that's not primarily aiming at selling – the customer rewards the guidance or entertainment as trust when it is time to buy. Content production comes in many forms in content marketing, and you might want to consider what parts – if any – should be outsourced. Typically marketing and communications departments are strong in some areas, and weaker in others. However, new areas should be explored boldly – just because something has always been outsourced doesn't mean the talent couldn't be acquired with recruiting or learning. Most of content marketing is written content: blogs, newsletters, guides, articles, website content etc. Writing is a core competence in marketing and communications, so it's natural that most of the content production that has to do with writing is done internally. + Content production and organizing it usually takes a lot of time and by outsourcing this time can be used for other tasks. + If a good writer can't be found inside the company, outsourcing is almost mandatory. + Utilizing the skills of a student or a blogger that is interested in the subject might work very well and doesn't require great commitment or a high budget. + Sometimes you see topics more clearly from the outside than up-close, and it might be easier for an outside writer to approach things “from a customer's point of view”. + Producing flawless text might be time-consuming especially in the beginning – although, surely not all content marketing requires total perfection. - A personal blog is often an important tool in person branding, and creates credibility not only for the company but for its personnel and might bear interview requests. - Typically it is known best internally what works for your target group and what the customers have on their minds. - You learn to write – and maintain the skill – by writing. The language of someone who writes continuously stays automatically good, and the text naturally improves. When most of the writing has been outsourced, this skill starts to deterioriate. - Internal operations are more flexible than working with an outside reporter, a current topic can be reacted to immediately when the writers are in-house. A growing amount of content is pictures and videos. The era of stock images is over, and real pictures of real situations can be found on websites, social media and newsletters. The threshold to do video production and image retouching lowers all the time when easy banner and infographics programs that produce great-looking content in an instant become available in addition to traditional image processing programs. + High-quality pictures and videos are effective in brand creation, and you can get by for years with a good selection of images. + A good base creates a direction for other graphics as well and helps with even the more casual photo choices. - Good equipment for shooting pictures and video can be found at a relatively low cost and it might pay itself back quite fast. - An increasing number of marketing and communications specialists have enough photography, videography and retouching skills and top-quality results can be achieved with a fraction of a professional photographer's fee. - Mobile phone pictures and videos are usually good enough for social media. Read here on how to get started. Image: Liana Technologies combines the skills of professional photographers and the marketing team, and in addition the personnel has been strongly involved in social media content creation, and for example a great deal of Instagram pictures and videos are recordings of the everyday life of the #lianacrew. Here Veera lurks behind the camera with Yini, Taru and Nicolas at the Oulu office in Finland. Have high-quality pictures and a brand video made by a professional every couple of years, and use a professional photographer only in very challenging conditions (for example, product shoots, events, 360° shooting). Produce social media, newsletter and website pictures and marketing videos for constant need with good equipment internally. It wasn't long ago when search engine optimization and marketing were assumed to be the work for only highly specialized agencies. Nowadays more and more companies do most of this work internally as part of content marketing, and pointless SEO mystification has been shed ages ago. Search engine marketing is easy to start with, and great results can be achieved with small investments and minimal effort. Fine-tuning and specification can be done infinitely and with big budgets it might be a good idea to use professional help for cost-effective reasons. Continuity and perseverance belong in both internal and external operating: SEO campaigns or short-term outsourcing don't make sense because working with search engines is more of an everyday task and on-going work. + Search engine optimization and marketing change constantly and keeping up with the pace can be a challenge. + Official search engine partners keep up with the changes in a way that an individual person seldom can. - Search engine optimization is an everyday task and virtually impossible to outsource completely. High-quality content production and technically correct ways of operating, as well as top of the line tools hold the greatest importance. - Search engine optimization, search engine marketing and content production support each other and therefore they are a natural entity to be done in-house. When the same words circulate in both search engine ads and in the keyword tool, the content creator learns to use the right words in the blog and finds out what works in newsletter headlines. When an SEO agency handles the big picture and makes sure that the content creation team is continuously up to date and hints which direction should be taken at any given time, search engine optimization works in a larger scale as well as in everyday operations. Email marketing - agency or in-house? Email marketing has been moving more and more in-house – and for a reason. But sometimes it pays to combine forces. + A good agency will often design a more professional, stylish newsletter template than one could in-house (without an in-house design team). - It takes much more time and effort to create a newsletter with an agency rather than compiling it yourself with the modern drag & drop interfaces – nowadays you do not need to know how to code, and training and support is typically included in the use of the tools! 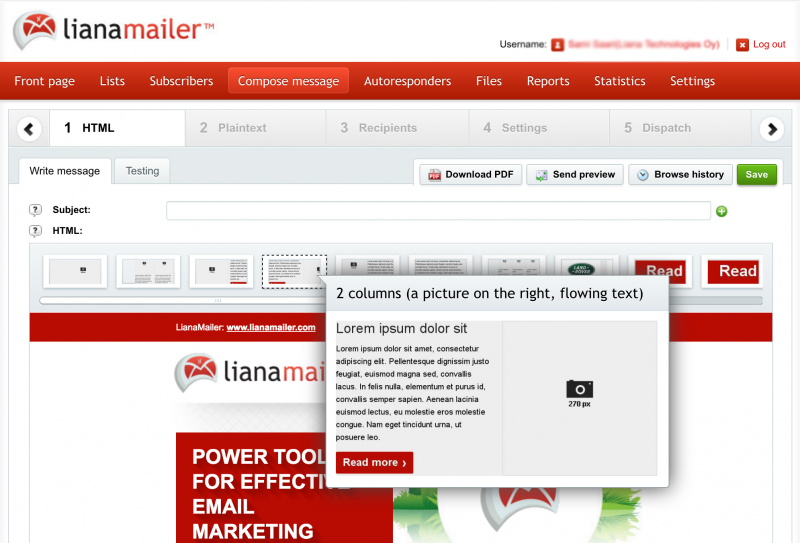 Picture: Modern email marketing tools with their drag & drop interfaces are designed for in-house use. - For most companies, email marketing is the number 1 seller with the best ROI of all marketing tools. Keeping such an important tool close to home and making sure everything is perfect and keep improving, may be very beneficial. - When using an in-house tool, you yourself can see all the time what is happening: who is opening, who is clicking, which titles work the best, what kind of content and offers are most popular. - When using an in-house tool you know everything is secure: where the servers are, where the databases are held, what country legislation is being followed etc. - It is easier to track how your messages are going through, when you are the one operating the system. - You can be absolutely sure about important things yourself: analyze content with a spam filter tool, test the email sending on different email and mobile tools straight from your system, etc. - Email marketing is not only useful for campaigns, but actually the best results come by using it for various purposes: customer newsletters (monthly/weekly), prospect newsletters (hint: share with your sales teams the openers and clickers! ), internal newsletter, news to other stakeholders such as the media and stock holders, etc. With an in-house tool, you can easily develop your email marketing without adding the costs. - You don't need to hand out your customer lists anywhere, but they are safe and organized in your email marketing tool. - When you yourself have access to all the messages sent out and also their reports, you can easily see what is going on and develop what you are doing. - If you have something important to tell your customers right now, it does not take more than a few minutes to create a good-looking email sending, test it and send it out to the contacts of your choice. - In the long run handling large amounts of customer data may be easier, if the email marketing tool is integrated for instance with your CRM tool or other customer database. - Use an outside provider to design a stylish drag & drop layout according to your brand quidelines, but send, follow up and report your campaigns/monthly newsletters etc. yourself. Liana Technologies' PR Cloud and Marketing Cloud tools are designed so that it is easy to handle the operations of marketing and communications both internally, as well as with external partners. Invite our sales team over for a visit or ask tips from our Account Managers on how your processes could be organized more effectively. Ask us about search engine optimization and search engine marketing services as well! Outsourcing for accounting is always a win-win situation from both end, buyer and provider. The buyer goes for outsourcing any service either he is not that much professional in that field or he doesn't have enough time to spend on this. And most importantly saving money is a concern. So, if someone can find the best service provider who are capable to meet his needs as per requirement and within expected budget then Outsourcing is really interesting to him. But it is not an easy task to find out suitable provider as there are too many out there. Unfortunately if someone falls in the trap of an amateur provider then he loses his time, money and most importantly faith. Competent providers never let their clients/buyers down in terms of getting possibly best service. Once it gets going, it hardly stops. Communication is always a barrier in outsourcing business whether it is written or voice communication. If there is a key project manager from both end and they have good capability to make things comprehensible and easier then it can be overcome. I prefer using visible content (if possible). A single picture can convey clearer message than thousands words to some extents.